The Tiger enclosure at the San Francisco Zoo in January 1959. This has nothing to do with Kuranda but you might find it interesting regarding a current news item. In 1959 I was 17 years old. The recently formed San Francisco Zoological Society contracted to do a television program on the “educational TV station” KQED Channel 9. I was a member of the Student Section of the California Academy of Sciences in San Francisco and was selected to join the San Francisco Zoo Director, Carey Baldwin, to do the show. I acted as his student asking questions and helping with the livestock that was taken to the studio each week. The program lasted for two seasons. I lived only a few blocks from the zoo and Mr. Baldwin and I became very good friends. He was most entertaining and I could regale you with many stories. One immediately came to mind when I heard about the recent tiger incident at the San Francisco Zoo. One evening Mr. Baldwin invited me over to his house after dinner to see if "we had a problem with a tiger". I forget the tiger's name but Mr. Baldwin had been told by one of the zookeepers that the tiger might be able to escape by jumping across the moat and onto the flowerbed between the public guard rail and the moat. We got a large piece of meat and tied it to a long bamboo pole and approached the tiger enclosure. We were at the other end of the bamboo pole--about 15 ft away from the meat. Mr. Baldwin held the pole at the edge of our side of the moat. Once the tiger saw it, he literally flew across the moat from his position on the other side, grabbed the meat, and sprung back to the grotto all in one graceful movement. It happened so quickly that it was hard to believe what we had seen. Immediately we got into Mr. Baldwin's car, drove around to the other side of the enclosures, and entered the Lion House where we coaxed Mr. Tiger into its indoor holding cage. Then Mr. Baldwin closed the tiger's access to the outside--supposedly forever. Notes were left to the zookeepers to never let this tiger outside again. 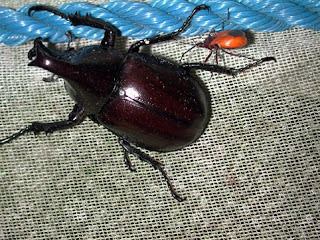 This little bug, Dindymus sp., has tapped into the blood supply of this large Rhinoceros Beetle (Scarabaeidae) by piercing through the tender membrane between the joints of the leg. Not much sustenance in this small snail. 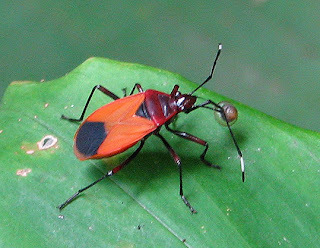 The family Pyrrhocoridae is commonly known as Cotton Stainers, Pyrrhocoridae because the crushed bodies of the bugs during cotton harvest stain the cotton and reduce its quality. Many are very serious pests of plants, especially the Malvaceae. Not all are damaging species, however. At least one rainforest species of Dindymus is a predator. This little bug is a regular visitor to the light sheet where it has been observed feeding on a variety of unsuspecting insects and even a small snail. A swath of rakings that Mr Turkey insists must be in just this spot! 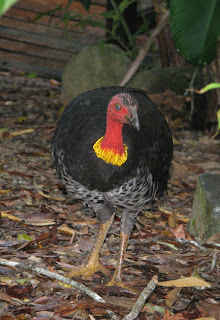 The Australian Brush (not Bush) Turkey, Alectura lathami, is the curse of every gardener from Gosford, New South Wales to Cape York Queensland. 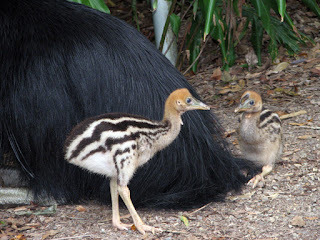 These birds are magapodes and are only very distantly related to the turkey of North America, Brush-turkey But many a person has wished to be able to put these birds on the table as a punishment for the damage they cause. 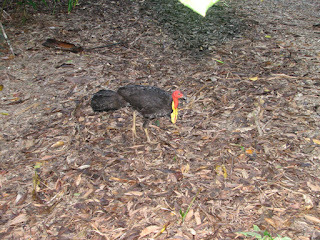 Megapodes are mound builders—chicken-like birds with big feet suitable to raking and scraping,Megapodes they are common residents of many places in Australasia EAST of Wallace’s Line, Wallace Line. 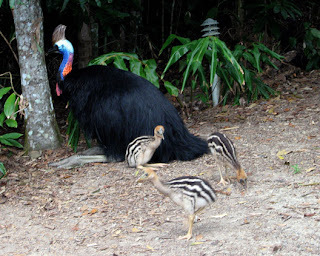 Each species except the Malleefowl live in jungle or woodland habitats where they build large mounds of leaves and detritus. Depending on the species, these can be up to 5 m by 3 m high. 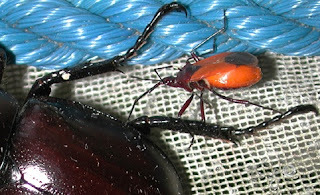 They are used over and over again and may be used by succeeding dominant males. Eggs are laid within the mounds and are dependent upon the temperature of the mound to develop. The male can regulate the temperature by adding or subtracting leaves and mulch. The have temperature-sensitive organs on the head to determine this. 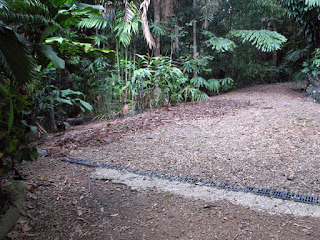 Problems with Brush Turkeys and humans occur when the turkey decides to rake clean the garden bed of all its mulch and leaf litter. This is often just a matter of dominance. The dominant male in our neighbourhood has been raking the same spot for weeks and weeks. For some peculiar reason that the turkey does not understand, I don’t want a pile of leaves in my driveway and I rake them back into the rainforest. Within minutes they are thrown back on the driveway just the way he wanted them. This goes on repeatedly. Sometimes I rake this pile 4 times a day. An equally difficult situation develops during the dry season when the birds are a bit stressed for food. They dig up- garden plants—only the really desirable ones! This year seems to be the worse one on record for this activity. Full grown Heliconia plants have fallen to the birds. They eat the flowers and then dig up the plants and eat the roots. Any really important plants have to be enclosed with chicken wire. But we wouldn’t be without them! These birds have strong, individual personalities and we can tell each of the 9 residents of our block apart from one another both by the size, shape and colour of their feet and their personalities. The same dominant male (with the long wattle) has been a resident here as long as we have. He bangs on the glass door several times a day for handouts and is not keen on waiting. He regularly throws sandals out in the driveway and overturns pot plants if he is kept waiting too long. And although mostly ground birds, the do fly and spend their nights high in the treetops away from predators. With the option to fly, no bird feeder escapes their detection and they clean out the contents in a matter of minutes. What perseverance! 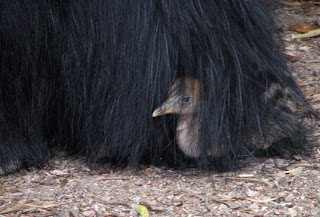 Long live the Brush Turkey! It’s been a bout a month since the newly hatched chicks arrived. Since then, they have doubled in size and their colour pattern is gradually changing from the rusty head and striped body to the rather uniformly brown that will adorn the chicks until they are mature.